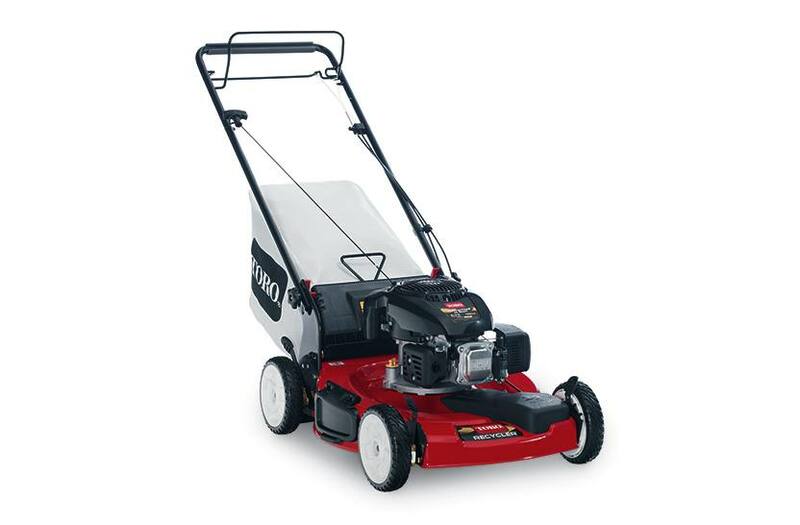 With a 3-in-1 mowing system, the Toro Recycler 22-inch 6.75 gross torque Kohler® OHV Gas Variable Speed Self-Propelled Walk-Behind Power Mower offers bagging, mulching and side discharge capabilities for flexible performance in all mowing conditions. The Recycler's 149 cc Overhead Valve engine provides great power while the self-propel front-wheel drive system makes mowing easy. CARB compliant. Kohler® OHV Engine with Auto Choke: Powerful Kohler overhead valve engine - No need to prime or choke with the Auto Choke starting system. It also has an Easy-Fill gas tank opening that reduces spilling when refueling. 22” Recycler® Cutting Deck: Cut more grass in less time and improve the health of your lawn with larger 22” cutting width. Toro’s innovative Recycler mulching system minces grass clippings into fine particles and puts them back into your lawn giving you a healthy, lush looking yard. The gross torque of this engine was laboratory rated at 2800 rpm per SAE J1940 by the engine manufacturer. As configured to meet safety, emission and operating requirements, the actual engine torque on this class of mower will be significantly lower. See dealer for warranty details.